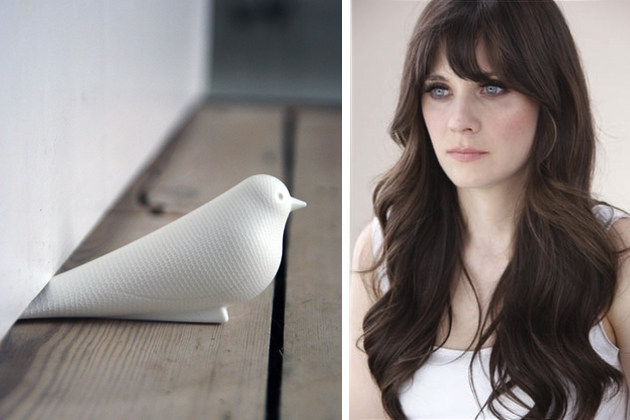 Today I'm swooning over this White Bird Door Stop (£10.95, approx. $18) and being jealous of Zooey Deschanel's gorgeous hair (via Kirtsy). Do you have great plans for the weekend? I'm still sick and feeling tired, plus it looks like it will be raining on Saturday here in Switzerland, so I think I'll just catch up with some work I need to do. On Sunday I'll do something mysterious... It's a surprise organized by a friend of mine, I'm so curious to know what it is! Have a wonderful weekend! I've just seen the same bird door step 2 days ago, in France (to Pylone's) So cute!!! my plans for the weekend are.. PACKING! i've just came back from the thermal baths in Bormio (not far from Switzerland! you know that?) and I'm leaving soon for the seaside..
LOVE your blog. So happy I found it :) New follower! @Justina : I second that! @vivi : Wow, lucky you! That is so cool! @Alycia : Thanks so much!